A truck-driver returns to his semi after taking a break and utilitzing the west Glenwood parking area along Highway 6. Tractor-trailers line U.S. Highway 6 in West Glenwood last summer. The city of Glenwood Springs is concerned CDOT’s plan to accomodate more parking whithin the highway corridor. The Department of Transportation presented plans for four commercial motorized vehicle (CMV) parking sites, two close to retail and residences in West Glenwood. The Colorado Department of Transportation intends to build permanent commercial truck parking spaces along U.S. Highway 6 in West Glenwood, and there is nothing the city can do to stop it. 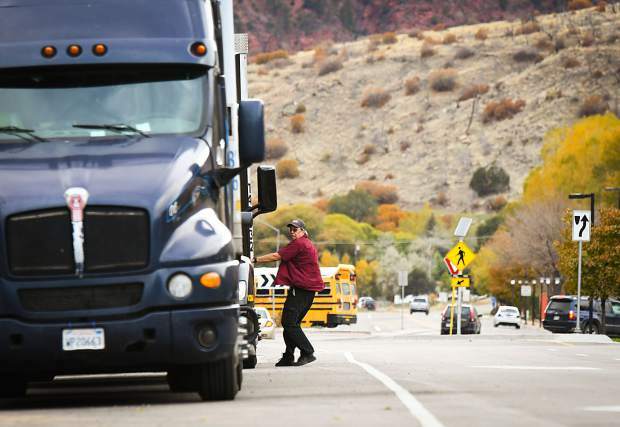 That was the takeaway from a heated exchange at a Glenwood Springs City Council work session Oct. 18, where CDOT engineers presented the plan and took criticism from the councilors and city staff for what some say will turn West Glenwood into a truck stop. Commercial trucks have used the shoulder of Highway 6 as a pull-off for some time. The drivers park to rest or wait out hazardous conditions through Glenwood Canyon. But maneuvering back to I-70 with no designated turning lanes poses safety risks. 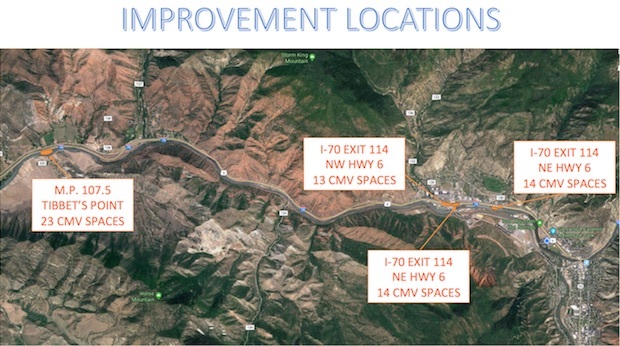 Safety is the main reason CDOT plans to build 27 spaces along Highway 6 — 13 on the west side of the north roundabout off of Exit 114, and 14 to the east. Representatives of the state agency have observed trucks doing a number of unsafe and illegal maneuvers, like making u-turns across the four-lane highway. The West Glenwood additions are two of four sites being designated to increase capacity for commercial motor vehicle (CMV) parking. The old rest stop at eastbound mile post 115 will also be restored with 13 CMV spaces. And, farther west on I-70, the existing boat launch area known as Tibbet’s Point, near mile post 107, will become a pull-off with 23 designated spots for trucks, plus 15 spots for boat-trailer parking. 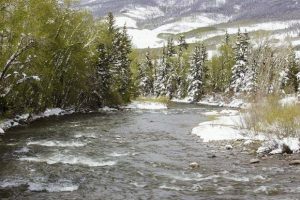 CDOT intends to put in toilets and improve the boat ramp as well. 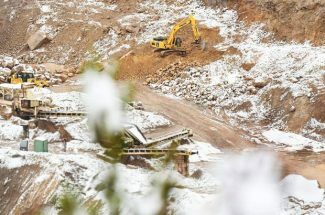 CDOT officials stressed the importance of accommodating truck freight near the canyon, pointing out that many of the trucks that rest along Highway 6 are making deliveries to Glenwood Springs. The construction itself would have minimal impact, they said, as it’s all shoulder work along state-owned right of way. CDOT hopes to begin constructing the truck parking areas next spring. For City Council, though, building parking spaces is like putting out the welcome mat for truckers and all that is associated with truck stops, and could prevent that area of town from developing. “Thirteen parking spots is a truck stop. That’s a bad impression for a town driven by tourism,” City Councilor Jonathan Godes said at the Oct. 18 meeting. He agreed trucks need places to park safely, but wondered why it had to be in an area that could some day be developed for tourism or for living spaces. 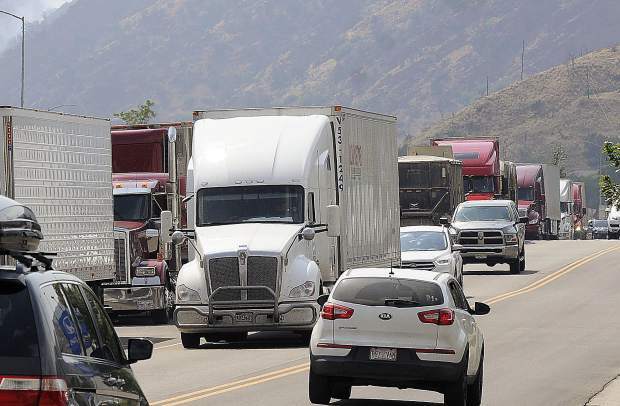 Truck stops bring a number of issues, Mayor Michael Gamba said, like traffic congestion and noise, environmental concerns like emissions from idling, and sanitation concerns — CDOT currently has no plan to build toilets at the West Glenwood truck parking spots. 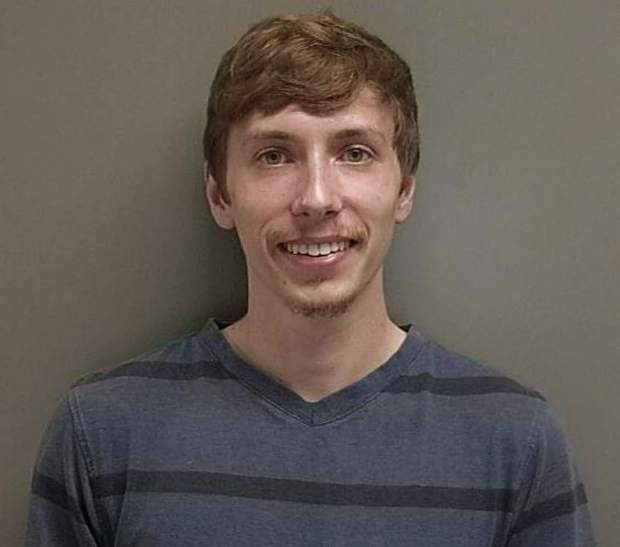 Truck stops could also bring prostitution and human trafficking, Gamba said, though he admitted the association was purely anecdotal. One of the CDOT engineers turned Gamba’s example around: “To continue your analogy, we have pigs out there already. We’re putting up pens for them,” said Andrew Knapp, resident engineer for CDOT in Glenwood Springs. “We’re trying to reduce the footprint,” Todd Ipsen, professional engineer for CDOT, told the council. He said CDOT would prefer to have even more parking in West Glenwood, but kept the number low to lessen the community impact. The fact that CDOT did not involve the city in the planning process rankled the councilors. “[CDOT] doesn’t really care that much about what we’re doing or what our needs are,” Godes said in an interview after the meeting. It felt like the city was being informed of CDOT’s plans, he said, compared to the Grand Avenue Bridge project, where CDOT held numerous public meetings to work with the community. Godes walked out of the meeting out of frustration with the process. CDOT did hold an informational meeting at the West Glenwood Mall earlier last week, and informed local businesses and Glenwood Springs Middle School of the event. But that meeting was poorly attended, according to Godes. 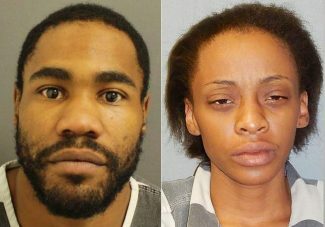 “It isn’t a surprise that three people showed up to that meeting, because no one knew about it,” Godes said. Gamba thanked CDOT for presenting the plan, and said he was not critical of the individuals involved in the project. But he said he was disappointed the city wasn’t approached sooner in the planning process. “City Council usually believes they have influence in the projects that happen in the city,” City Manager Deborah Figueroa said in an interview after the meeting. “We do understand that CDOT can build what they would like to in their right of way,” Figueroa said. For now, the council will prepare a list of recommendations for ways CDOT could improve the parking sites. Planting trees and sound barriers were discussed as possible options, as well as finding ways to discourage truck idling. “We will give them our ideas. 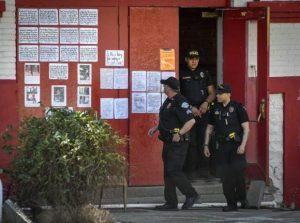 I don’t know how much they’ll be willing to change their plans,” Figueroa said.